The world is now facing a great tide of change. The trend of digital transformation cannot be stopped and is drastically changing many aspects of society, including public administration, industrial structure, employment and people’s private lives. There are countless directions in which society will be advanced by technological development. While technology could bring about improvements such as higher standards of living and greater convenience, it could have negative effects too, such as impact on employment, growing disparity and unequal distribution of wealth and information. It is up to us in which direction we choose to go. We must consider what kind of society we wish to create, rather than trying to foresee the kind of society it will be. Therefore, Japan will take the initiative in guiding the world towards a brighter future by showing an ideal concept of the next society, which we call Society 5.0. In its latest report, Keidanren (Japan Business Federation) has redefined Society 5.0 as the "Imagination Society". People will be expected to exercise rich imaginations to identify a variety of needs and challenges scattered across society and the scenarios to solve them, as well as creativity to realize such solutions by using digital technologies and data. Society 5.0 will be an Imagination Society, where digital transformation combines with the creativity of diverse people to bring about "problem solving" and "value creation" that lead us to sustainable development. It is a concept that can contribute to the achievement of the Sustainable Development Goals (SDGs) adopted by the United Nations. In Society 5.0, people will be liberated from various constraints that previous incarnations up until Society 4.0 could not overcome, and will obtain the freedom to pursue diverse lifestyles and values. People will be liberated from focus on efficiency. Instead, the emphasis will be placed on satisfying individual needs, solving problems and creating value. People will be able to live, learn and work, free from suppressive influences on individuality, such as discrimination by gender, race, nationality, etc. and alienation because of their values and ways of thinking. People will be liberated from the disparity caused by the concentration of wealth and information, and anyone will be able to get opportunities to play a part any time, anywhere. People will be liberated from anxiety about terrorism, disasters and cyberattacks, and live with security with strengthened safety nets for unemployment and poverty. People will be liberated from resources and environmental constraints, and able to live sustainable lives in any region. In short, we will make Society 5.0 a society in which anyone can create value any time, anywhere, with security and in harmony with nature. 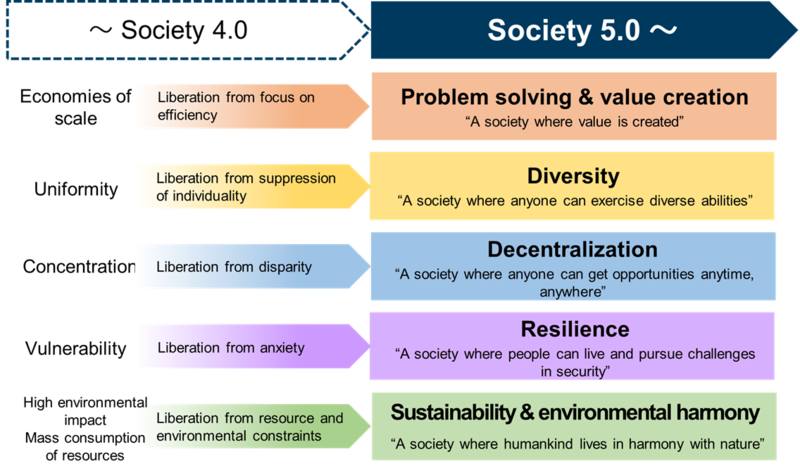 In the report, we have described specific instances of Society 5.0 in several key areas. Taking healthcare as an example, we will provide personalized and preventive care by collecting and analyzing individual health and medical data over a lifetime so that people can live longer with good health. If Japan is successful in creating such a healthcare system, it can be applied to other countries facing an ageing society in the near future, thus contributing to the attainment of the 3rd SDG. Keidanren is urging the government to establish the infrastructure to link health and medical data and make it available for various actors to provide better healthcare services. At the same time, it continues dialogue with the academic and medical sectors to break down sectionalism and build partnerships for a comprehensive healthcare system. Keidanren is working together with the government and other stakeholders on corporate and labor policy reform, human resource development, establishment of data policy, enhancement of research and development, governmental reform, etc. for the realization of Society 5.0. It wishes to share the goal with its partners around the world and co-create the future.